We could not explain it any better than these OffSet™ customers. 5.0 out of 5 starsYou don’t have this pedal yet ! Can’t believe I’ve been playing without this pedal . Nothing compares to it . Discover a new freedom setting up any style of drum kit without sacrificing comfort!. This pedal is extremely solid , adjusting to any technique you you can throw at it . I can tell you I’d never even tried this pedal till I received it , I set it up and I never left my drum stool. THIS HAS TO BE ONE OF THE GREATEST DRUM SET INNOVATIONS OF THE LAST 40 YEARS. MECHANICALLY VERY SOUND. ALLOWS YOU TO BE CENTERED AND NOT RESTRICTED TO BEING A RIGHTY OR LEFTY WHEN LEARNING TO PLAY YOUR KIT!! FOR ME THE CONVERSION FROM CHAIN TO DIRECT FEELS LIKE I'M PLAYING TWO SPEED KINGS. LOVE IT!!! 5.0 out of 5 stars Great idea and concept, very well executed! 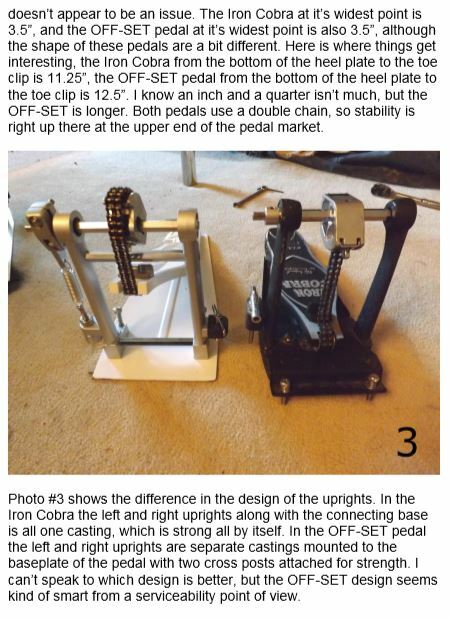 I’ve come across the concept of these unique pedals some time ago after seeing a FB-post by a friend sharing a link to the OffSet pedal. This triggered my interest. 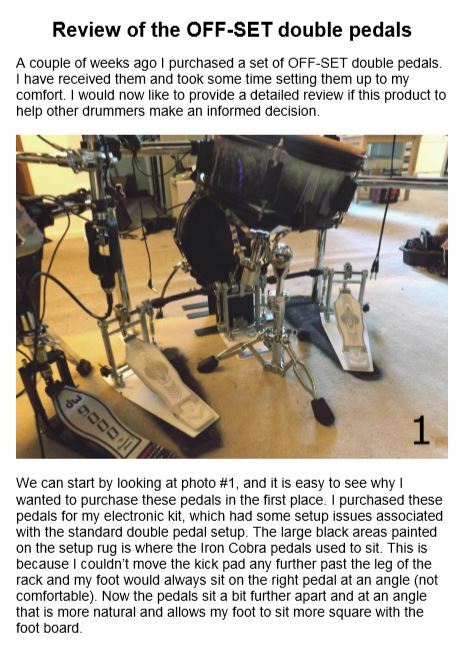 I had seen similar concepts of other brands in the past and over the years but somehow the idea of playing a middle pedal didn’t really appeal to me back then as an option. Lately, I’ve been looking into various alternative ways of setting up drumsets in order to find some inspiration for optimizing the setup of the drums , especially in regards to a more ergonomic playing. Unfortunately, there is no German or European distribution for this pedal yet so I’ve been spinning the idea of getting one of these in my head for quite some before I finally decided to go for it and taking advantage of the Amazon offer. The shipping time of 6 days was unexpectedly fast considering USA to Europe - a nice surprise. The pedal(s) come in a more or less standard carton but safely packed. Taking the pedals out of the box, seeing and feeling the material and understanding the construction and concept you can immediately tell that it is not a cheap, “me-too” sort of product just riding on an alternative idea only build as a “gimmick”. OffSet really took things serious here and the final product is obviously made from a drummer’s perspective in regards to build-quality and functionality. 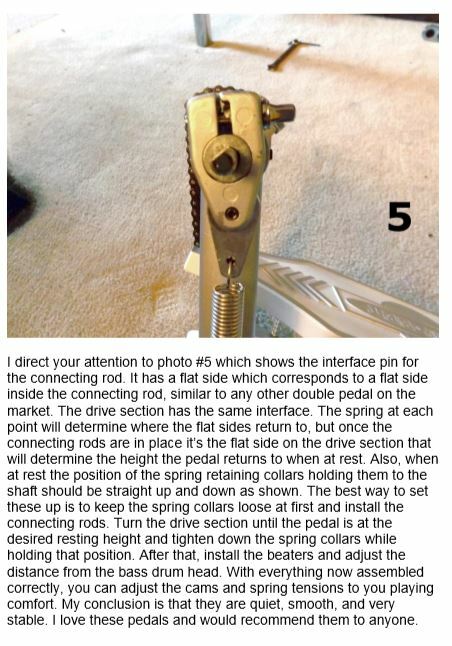 Although it has many adjustable parts everywhere which makes it really easy to be fine-tuned and to adjust everything to your specific needs and preferences, I found the pedals relatively easy to setup (if you’re already used to normal double pedals). The re-arranging of the drumset and its individual drums to be in-sync with the now centered set-up, however, takes a little more time. Also, getting used to it in your playing needs some time and practice, but it wasn’t too much of a deal for me after all. What I also enjoy very much is the “new equality” of how I’m playing the bassdrum with this pedal: with a normal doube pedal it is more or less natural that your right foot has a stronger and louder sounding punch in comparison to the left (slave side) foot. What we drummers learn to do when playing doublebass on a single bassdrum, is to level out the sound and attack differences somehow. With the OffSet, the fact that both pedals are practically slave pedals, so to speak, makes for a different feel and leads to much more consistent, equal sounding left and right foot beats. You may argue that this is due to the fact, that your right-foot pedal no lacks the direct, immediate power transmission - and , yes, this is also true, I guess. However, I found it easy to get used to it in real life playing and rather embrace the benefit of having a more leveled-sounding double bassdrum sound. 5.0 out of 5 stars A great pedal at a really great price! I got rid of my Iron Cobra, Gibraltar G Series, Demon Drive & DW pedals because of this! It is lightning fast, comfortable and ergonomic! The quality is there as well. It doesn't seem as substantial as the others as for its size it is pretty light. I just love this pedal! I have played Pearl pedals for over 40 years. I switched from Pearl to Tama and then Gibraltar G Series, then DW and lastly to Evolution Offset pedals! I've had them for months and they seem to get better the more I use them! 5.0 out of 5 stars Perfect. Flawlessly executed. Way more than I expected. The features and build quality are way above the price tag. I was concerned that the cam arms wouldn’t feel “normal” but those concerns vanished immediately. The pedal is rock solid with tons of feel and smooth power. The bonus of having a centered snare for recording and a more compact kit layout it’s crazy to not ditch the traditional long arm pedals and move into the better configuration. 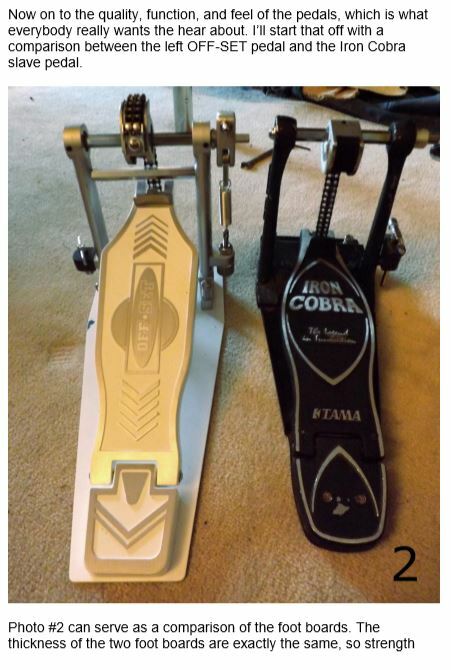 I’m a longtime double bass player and I have always wished for both pedals of a double pedal to feel identical. (like two single pedals on two drums) I’ve tried every brand and these for me are the closest to feeling matched. 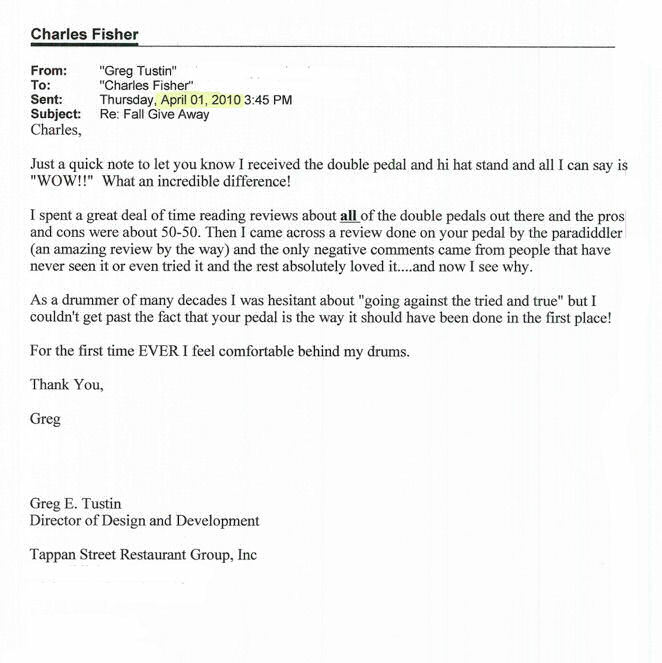 I had a question regarding the footboard and they replied that day. The pedals are really heavy duty and one of the best beater attachments to the rim and slave pedal spikes out there. I highly recommend. A number of years ago a chiropractor informed me my hips were out of alignment, which throws my spine out of alignment and was causing me back pain. I couldn't figure out why my hips were out like that. It even created a length difference in my legs. Years later, after reading an article in Modern Drummer, it dawned on me the hip problem was probably caused by 25 plus years of playing double bass in the traditional set up; either with a second bass off to my left, or using a typical dble. pedal. I've owned a few of them, all good for what they are and do, but I have consistently felt discomfort in my back, right knee and even right ankle after playing long amounts of time. Upon reading about the Off-Set pedal on a discussion board I looked it up and purchased one. Man, what a great pedal. It's built like a tank, is very quiet, smooth and solid feeling, has all these great adjustment features, and in less than 15 minutes I had it set up and flying. Just a great device. The feeling of natural balance while playing makes things like coordination and speed all the more effortless to achieve, and there is no displacement of twisting my hips to play the traditional pedal set up, and no discomfort in my back, knee or ankle. This device seems ideal to start younger players on before any body problems develop. I hope you sell a million of them. My name is Eric Andre’ Majied. I’ve been a music educator for 20 years and a student of drumming since age 2. I’ve most recently purchased your product; The “Off-Set” Drum Pedal. Please know that I’ve been searching for this idea and or ideal product for at least 18 years. While I’m currently the Director of Bands at Central High School here in Flint, Michigan, I also teach privately at Bill Schaffer’s Drum Shop. I’m really excited about the response I’ve observed from adults and students who’ve tried the Off-Set Pedal. This pedal system is truly a revolution in drumming comfort. 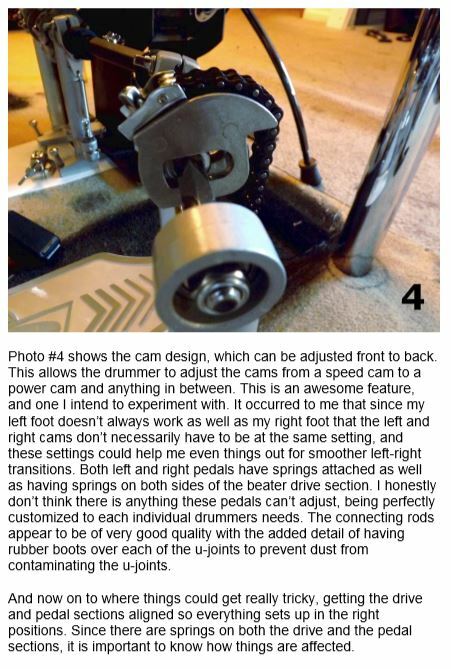 Any of my students or Drum Shop visitors who sit and try the pedal immediately acquire a perfect feeling of body balance, stroke control and stroke attack. The most impressive aspect of the Off-Set in my opinion is the strength of its construction. The Off-Set Pedal is the OPTIMUM DESIGN for Bass Double Pedaling!!! I don't even know if this email is still current but as I've just stumbled across our correspondence in my archive and thought I would fire you off a quick email. 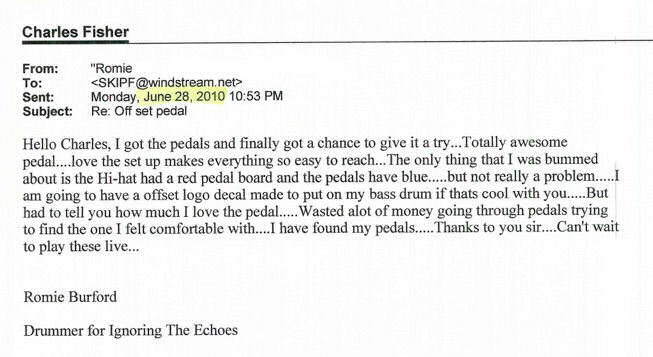 It is hard to believe that it is more than six years since I purchased an Off Set pedal from you. Over the years I have accumulated many pedals to try out. Included amongst what was a shamefully large collection was the Sleishman and a Malleus Middle Pedal. For a long time I didn't use the Off Set as I just had so many different pedals to choose from, I rarely took the time to fine tune feel and function. In addition to my three middle pedals I also had a DW9000 which I tended to use the most. I still have it and it is a great pedal. 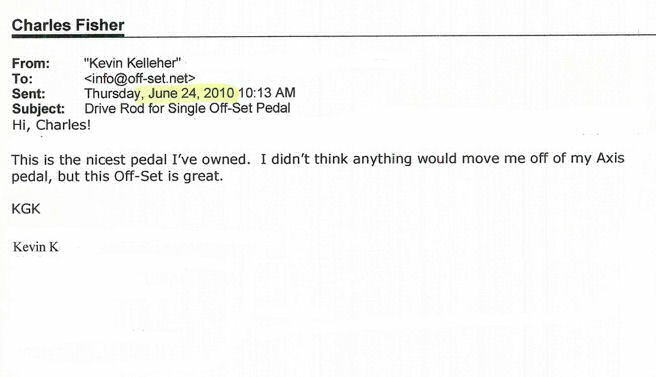 However, after deciding a year or so ago to have a purge, I sold many of the pedals I owned. I never considered getting rid of the Off Set though. Consequently with a much smaller collection of pedals to choose from, I dug out the Off Set once more and this time round really knuckled down to fine tune the action of the pedal to suit me. Now I don't think I could use anything else. In terms of build quality and the sheer breadth of adjustment that is possible, it really is an astonishing achievement for the money. I use the pedal every single day and it remains absolutely faultless. So, I just wanted to say thank you and I hope you continue to market and sell this wonderful and innovative product for many years to come. In time I will return to you for another. All the best Charles, and once again thank you. I purchased your Double Bass Drum Pedal system about a year ago. I have to tell you, it is the best decision I made that year. I was astounded at how easily I was able to take double bassing to a whole new level. 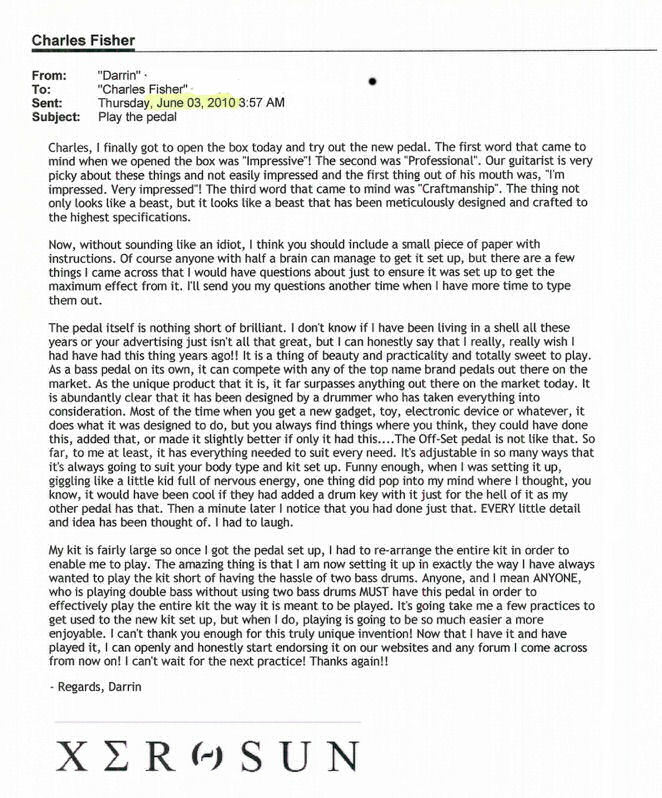 Amazing how ergonomics can improve playing, polymorphic in particular. I am writing in regard to the Off-Set double bass pedal. I purchased one from Drum World in PA, April 4th. I have been playing with it for three months . My reaction to the Off-Set was one of excitement and anticipation, as this design is perfect for my set up. Which was featured in March 2005 issue of Modern Drummer’s Drum-Kit of the Month. I must say your offset double is working out find. I’m trying to work out with it twice a week and I’m truly getting use to it. Yes, I would like to endorser this product. Thank you so much for your help and effort in making this work for me. I’ll be in touch. Don’t be afraid to slam it!